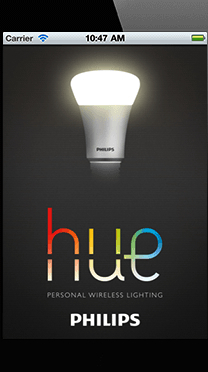 The humble light bulb has been given a makeover by Dutch electronics company Philips with the launch on Tuesday of its Hue personal wireless lighting system. 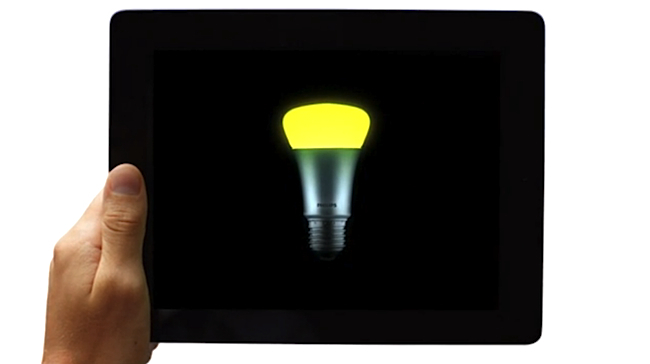 The new energy-saving LED bulb can glow any color you like, at any brightness, and can be controlled from anywhere in the world with the aid of – you guessed it – a smartphone app. It’s currently iOS only, though an Android version should be out in the coming months. Once you’ve screwed the special bulb into a regular light socket, you simply connect the supplied Hue bridge to your wireless home router and fire up the free app. – Hue as alarm clock: Timer options on the app allow you to gradually brighten the light in your room when you need to wake up. Better than the daily startle delivered daily by your alarm clock, no? – Hue as ambience creator: Recreate the light and ambience present in any of your photos by simply by dragging a picker across the photo to the color or tone you desire. Your bulb/s will automatically adjust to match the effect you’re after. – Hue as security guard: Going on vacation? Turn your lights on and off remotely to make it look as if you’re in. In addition, anyone who doesn’t like coming home to a dark house can use the timer to light up the place in advance. The app also features what Philips calls Light Recipes, special pre-sets for particular situations listed as Relax, Concentrate, Energize and Reading. A starter pack comprising three bulbs and the Hue bridge costs $199 goes on sale exclusively at Apple stores from Tuesday. Extra bulbs can be purchased for $59 each. And with the bridge able to support as many as 50 bulbs, you could soon have your home pulsating with all the color and vibrancy of a Pink Floyd concert, though quite why you’d want to do such a thing is anybody’s guess. Nokia Lumia 822 hands on: Windows Phone returns to Verizon!